The PSSC's July 20, 2013 meeting was held in San Clemente, Orange County. Combine: (a) two legendary palm gardens, tended for loving decades by two long-time PSSC members; (b) a location near the beach; (c) a Saturday in July; and (d) a gathering of friends, a potluck lunch, with meat provided, and an auction. You get: the PSSC’s July 20, 2013 meeting, at the homes and gardens of Walter Frey (“Fry”), and Ricardo Luna, both in San Clemente. Walter and Marla Frey , 1601 via Sage, San Clemente, CA 92673. 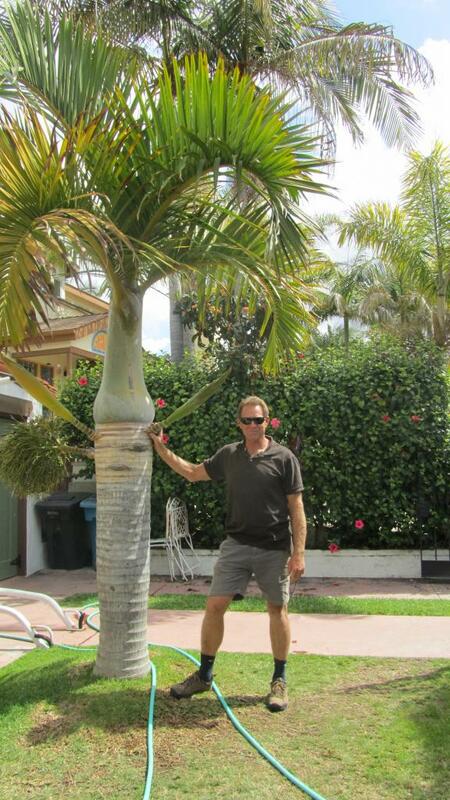 The Freys have taken maximum of advantage of their mild coastal climate to experiment with palms from all over the world. Highlights include: (a) truly spectacular blue Brahea species; (b) large Chambeyronias; and (c) many palms from Madagascar, New Caledonia and all the rest of the palm world. Ricardo and Marianne Luna, 114 West Paseo De Cristobal, San Clemente, CA 92672. The Luna place is within a short distance of the ocean, and the Lunas have pushed the envelope on rare palms very successfully. Highlights include: (a) a large Basselinia with a gorgeous crownshaft; (b) a nearly-mature Burretokentia koghiensis, ready to go to seed; (c) large Hedyscepe; (d) large Howea belmoreana: (e) a drop-dead gorgeous Dypsis baronii type with red petioles; (f) Chambeyronia macrocarpa setting seed; (g) Chambeyronia hookeri, very large; and (h) his famed Hyophorbe langencaulis and verschaffeltii. Approximately eighty people attended this meeting. The meeting included a pot luck lunch followed by a plant auction. Thanks to all who attended and all who donated plants and provided dishes for the pot luck.